Acumatica’s flexibility extends beyond the adaptability of the functionality and deployment, into deciding what suites of Acumatica ERP to license. No product is “one size fits all”. Too many features bog down the implementations and too few features impact your productivity. With Acumatica ERP you license only the modules you need now and add more when you are ready. Please visit Acumatica ERP Pricing to get better understand about our differentiating value for the customers. The table below compares the features that come standard with that edition and the optional functionality that can also be added to that edition. Acumatica allows you to focus on what you want to implement now and expand as you grow, and your requirements change. The table above reflects the feature for our standard offerings. 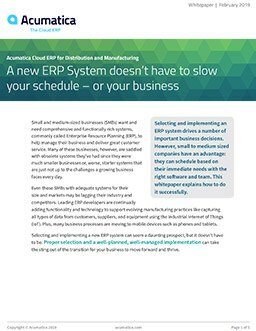 Acumatica also has editions for small businesses and enterprises. is included, is an optional, and blank cell is "not available"
Acumatica’s flexibility continues with allowing you three choices in licensing the software based on your business needs. An annual subscription license for Acumatica hosted in a public cloud, such as the Amazon Web Services. You pay a set monthly fee and your IT infrastructure, plus upgrades are handled by Acumatica. This “outsourcing” has become the fastest growing licensing option. An annual subscription license for Acumatica hosted in a private cloud with the hosting provider of your choice. You decide where the software and date is hosted and when updates are applied. A license for Acumatica that you pay upfront for the perpetual use of Acumatica ERP. This has been the legacy model and includes an annual maintenance charge. It can be deployed on your premise or in a hosted private cloud.